Growing up, I was never really into Star Trek. When I met my wife, she was a big fan of Star Trek: The Next Generation, especially the tie-in novels. So, I became a fan of Star Trek through her, but I've never really had a huge nostalgia connection to Star Trek. Because of this, I've been real open to enjoying some of the newesr Star Trek like Enterprise and the relaunch movies. 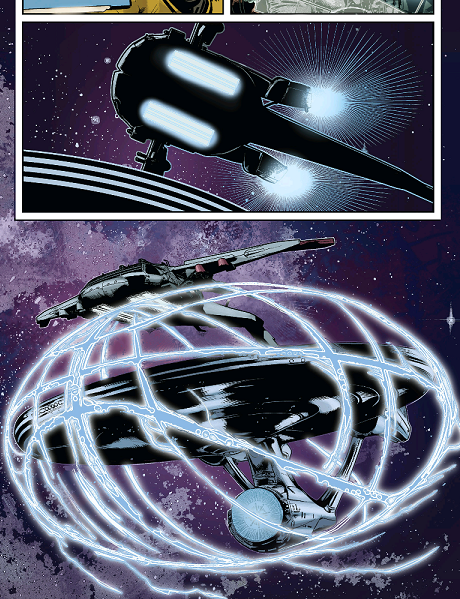 In the last issue, the Enteprise went to warp in order to escape a powerful entity that was having a nosh on their warp core. In the process, the Enterprise was flung into the Delta Quadrant, and the ship lost all the dilithium crystals they need to go to warp. They are 326 light years from the nearest known source of dilithium crystals...so the ride home might take a while at impulse power. A few weeks later as they trudged home, the Enterprise encounters a woman that their translators named Eurydice. 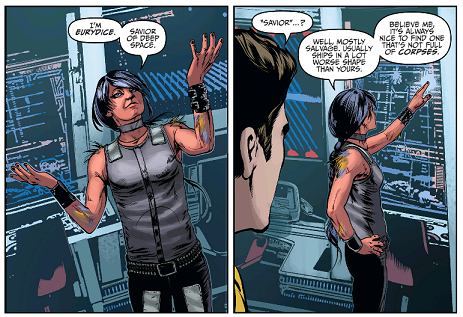 Uhura points out that in Greek Mythology, Eurydice died of a snake bite. This sort of was the core of a good idea, but I did think it was a little awkwardly constructed. For one thing, shouldn't she be a snake, not someone who died of a snake bite? And since when do the translators get so poetic? Since they are desperate, the Enterprise decides to trust Eurydice to help them get to a planet where they should be able to trade for dilithium. She puts them in a warp tractor beam and off they go. In the end, she reveals to the reader that she has her own mysterious agenda which will put the crew into danger. Typically when I pick a book to review, it is because there was something I really liked or hated about the issue. Or maybe it's a new series or a series that is getting a new creative team. To be honest, this book was none of those things. There is a bit of a change of direction with the Enterprise in the Delta Quadrant, but that was about it. But ,it had been a while since I reviewed an issue of this series, so I figured we should drop in for a look. 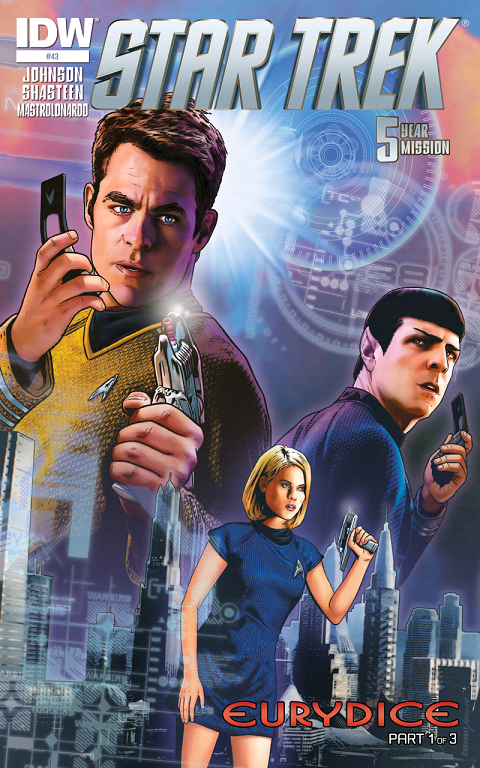 Star Trek continues to be a solid read each and every month, and this issue was no exception. The current arc with the Enterprise standed on the other side of the universe reminds me of Voyager, but I think it's more of a homage than a lack of creativity. This opens up the door for some new stories. Quite a bit of the comic series has focused on impending war with the Klingons, so this should help keep the series fresh. As typical for this series, there were some great character moments. I liked Spock and Uhura walking through the ship's greenhouse trying to decide if it was worth trying to maintain with the ship in crisis. And Eurydice seemed like a pretty cool character. My only gripe there is that she could have used a more unique design. One of my biggest complaints with Star Trek has always been that most of the aliens look way too humanoid. Enterprise did an excellent job changing that, especially in their later seasons. I understand makeup, costume, and budgetary constraints when it comes to TV series...but you shouldn't have that problem when it comes to comics. That said, Eurydice's ship had a nice design and the Enterprise crew looked a lot like the actors who play them in the movie. This is rare in adaptations. All in all, this was a solid issue of a solid series. It probably isn't enough to win over any new fans, but Star Trek fans will definitely enjoy it. This current "lost in the Delta Quadrant" arc has some huge potential, and I can't wait to see how it all plays out. Eurydice could have used a much more unique design and her name is a bit of a contrivance. Is it worth your $3.99? A real solid issue with no real faults. I've been enjoying this series, so I would definitely say check it out, especially if you've liked the new movies.